To visit their new, Google based, website you now need to use this link. Don’t forget to bookmark/favourite it for future reference as the url is rather long. A public consultation to be held in the Village Hall, Tresillian regarding the latest stage reached on the draft Neighbourhood Plan being prepared for the parish of St Clement. The parish includes the villages of St Clement, Tresillian and Malpas plus the area of Buckshead. Your views are important! Come along to view and discuss with Neighbourhood Steering Group members the latest progress on the plan. There will be plenty to see laid out on exhibition display panels as well as the current, work-in-progress version of the draft document. Quiz Night Wheel Inn – Tuesday April 30, 8.30pm. Hosted by Alison and Simon. Good cause this time is supporting purchasing of New Children’s Playing Equipment for Playing Field. 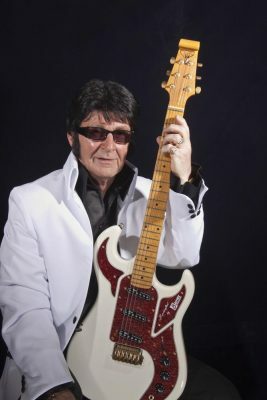 Justin Black, tribute and recording artist is to put on a concert performance at Tresillian Village Hall to help raise funds towards purchasing new children’s playing equipment for the Playing Field in Tresillian. Ticket price includes a Pasty Supper, bring your own drinks. There will also be a Prize Raffle. Tickets can be purchased at Mary’s Pasty Shop, Tresillian £10. 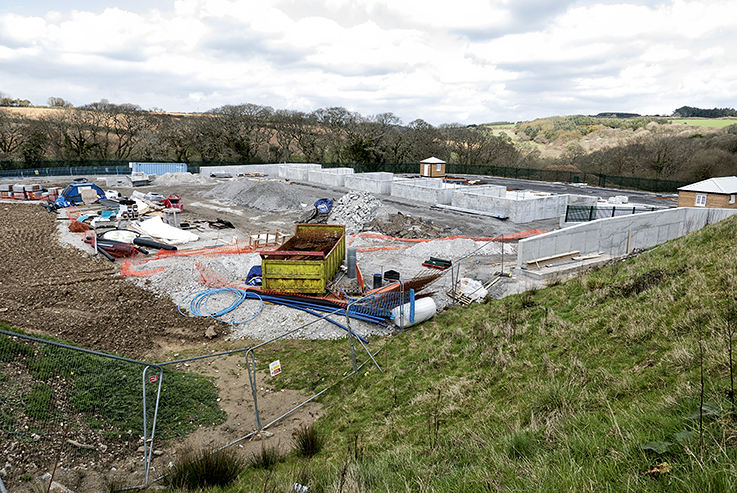 Work on Truro’s new Tregurra Park Recycling Centre has come to a halt! Construction work on the recycling centre has stopped due to Dawnus Construction Holdings Limited, the company building the site, having gone into administration. The company due to take over running of the site when completed is Suez Recycling and Recovery. Cornwall Council has been working with Suez to find a solution to get the work started again so that the centre can open as planned in the spring. Cornwall Council are currently seeking a new developer to take over the project with an expected delay of about five weeks. Litter pick in Tresillian on Sunday 24 March, meeting at the playing field at 10 a.m. As always, volunteers are most welcome. 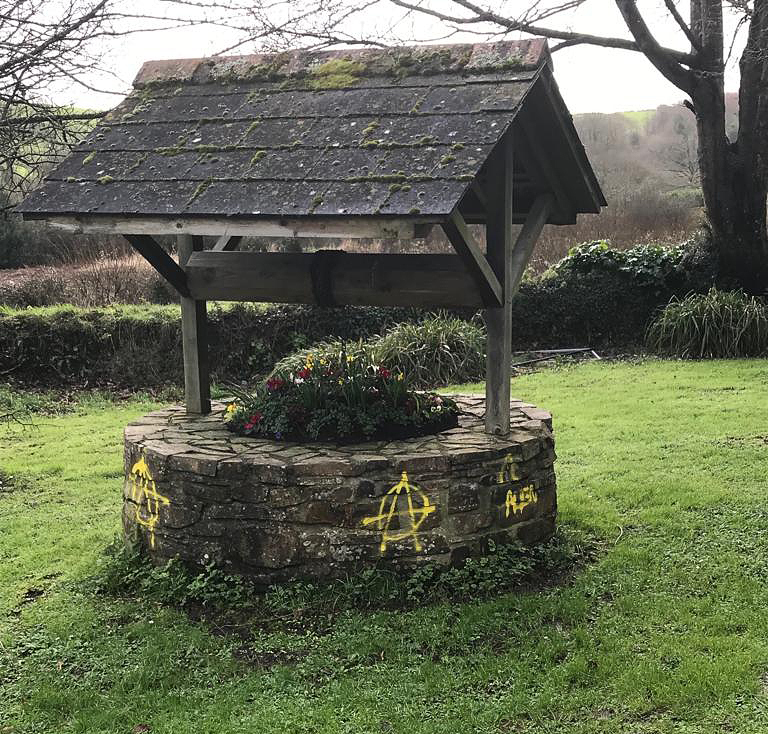 Sadly, the wishing well close to the Playing Field has been vandalised with ugly graffiti. The totally thoughtless person or persons who perpetrated the attack have shown utter contempt for those hard working individuals who voluntarily give up their spare time to enhance the local environment of our village. If anyone has any information as to who was responsible for this act of vandalism then please contact this website via the Contact page and your information will be passed on to the appropriate authority. Alternatively, you can leave your information anonymously via the Crimestoppers website or by calling them on: 0800 555 111. 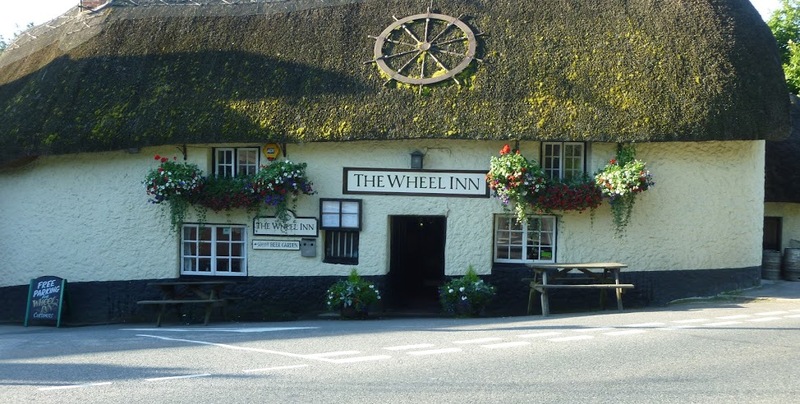 Quiz Night Wheel Inn – Tuesday March 12, 8.30pm. Hosted by Alison and Simon. Good cause this time is in aid of Children’s Hospice. Follow up. Another great, well supported, night at the Wheel Inn. A total of £170 was raised for the Children’s Hospice. Many thanks to all involved. 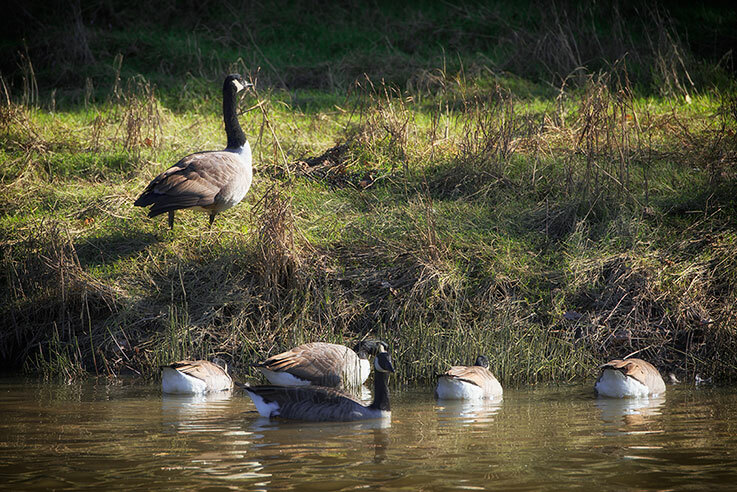 Wildlife articles can be accessed by visiting the Wildlife & Natural History Page and selecting the relevant year link at the bottom of the page. The Tresillian website welcomes any stories or photos of your wildlife/Natural History observations in Tresillian and its close environs. Hedgehog, bird or any other wild animal sighting or naturalised flowers or plants of interest that catch your attention. We would love to hear from you. Just get in contact via our Contact page and we will be back in touch with you about your story/photos. I am proposing setting up an organised collection of photographic images for our village that, hopefully, will remain as a permanent unified digital archive of life in Tresillian through the decades for future generations to have available. Building this archive relies heavily on source material being forthcoming. To that end I am asking residents of Tresillian (or known past residents that have moved away but may have some suitable images) to make contact with me regarding the loan of images so that I can make professional scans and return the original prints or negatives to the owner. This could turn out to be a quite substantial task and as a result I am expecting the building of the archive to be split into phases. For the initial phase I will be concentrating solely on gathering together a collection of older images from very early days up to and including 1979. If you think you may have some suitable photographs I can be contacted via the village website by emailing me using this website’s Contact page. There is no need to go into great detail at first as I will make contact to talk about any images you consider may be of interest. I’m really only looking to archive images that have recorded village life and how it has evolved through time. Eventually, as time allows, I will add more modern images from 1980 onwards to take the story forward. If possible, it would be very useful if you have information such as dates (roughly will do), names of people or locations or any other details you think may be of interest. If you don’t yet use email, please do ask a friend or neighbour to make contact on your behalf as old images are of particular interest for this first phase. As a person fascinated by local history I could not resist picking up from Chris Clarke’s excellent article published in the spring 2017 edition of TRAM Magazine regarding Tresillian’s missing milestone. His article stimulated me into taking up the challenge of conducting further research myself. Using additional information kindly supplied to me by village resident Lewis Mitchell, which he found on an old 1960 edition Ordnance Survey map, a distinct reference point has now been established. 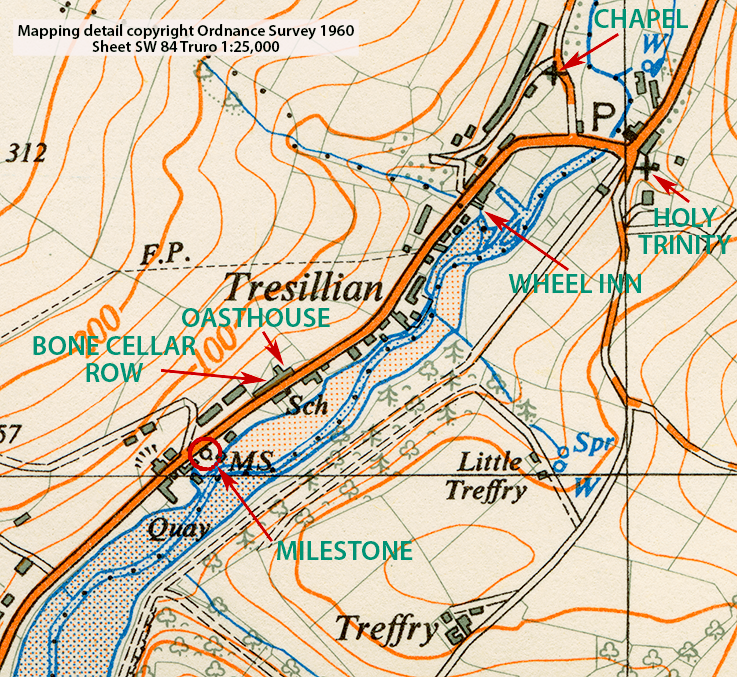 The Tresillian milestone’s position is marked on the OS map by the usual very small black dot accompanied by the letters MS, albeit slightly masked by a black circular graphic. Using my own copy of the same map, OS SW 84 Truro 1:25,000, I was also able to confirm the exact location. By cross referencing this data with Cornwall Council’s excellent online Interactive Map website I was able to double check the exact position where the milestone once stood, or at least close enough given the disruption created by the 1960s A390 road widening/levelling scheme and adjacent change of land-use. 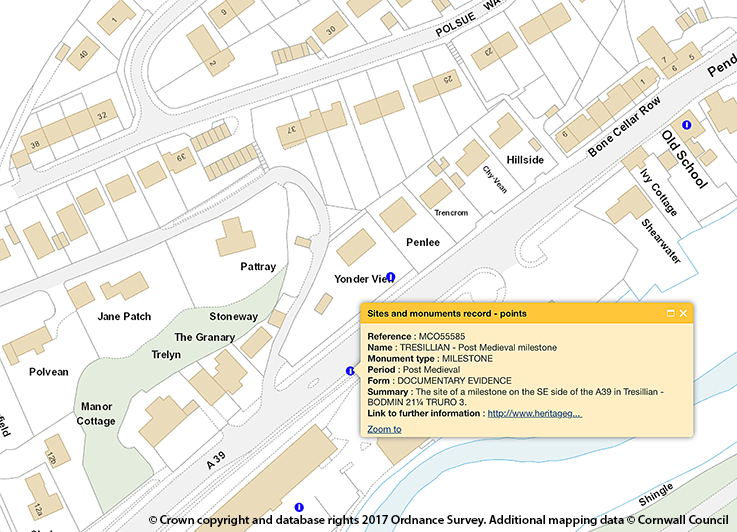 Both the 1960 OS map and CC’s Interactive Map show the location as being on the south side of the A390 where the current Audi dealership is situated. The site of a milestone on the SE side of the A39 in Tresillian – BODMIN 21¼ TRURO 3. A milestone is recored on the SE side of the A39 in Tresillian, on both the 1st Edition 1:2500 OS map, annotated TRURO 3 BODMIN 20, and on the 2nd Edition 1:2500 OS map c1907 annotated BODMIN 21¼ TRURO 3. The milestone is not recorded on the modern OS Mastermap 2010, suggesting it has been lost, possibly due to road alignment alterations in the C20. So, a milestone clearly did exist inside the village at a point along its main highway outside the current Audi dealership. Interestingly, the CC Interactive map has the A390 labeled as A39 at that point (note, must make CC aware of the error). 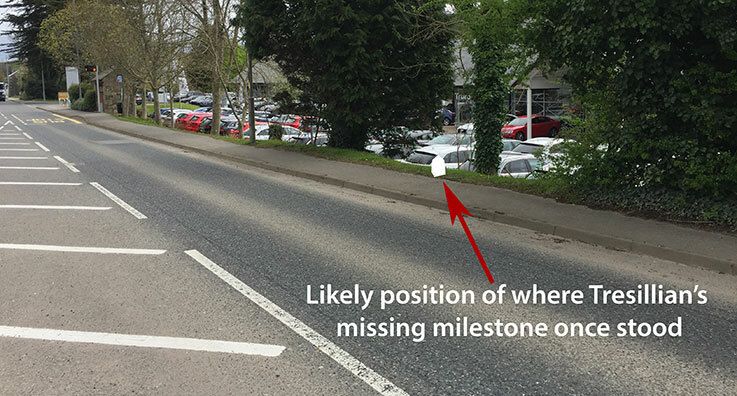 I have recently placed a request with our local parish council asking if, in the light of information now currently available, the possibility of the missing milestone being reinstated could be raised at a parish council meeting and that it could be pursued using the offices of the parish council. Let’s hope that Tresillian’s missing milestone can either be found languishing in a council yard somewhere and reinstated, or that a replica can be produced using information recorded by C&S’s HER database so that our village’s milestone is no longer the only one missing in the chain of 12 historical milestones that run from Truro to Braddon. If anyone has any more information or knowledge they think would be helpful or interesting regarding the missing milestone then please do contact me using the contact form on this site and I will publish it online as part of this continuing fascinating story. If you wish to receive emailed alerts as soon newsworthy items about village life are published online you can subscribe to the website for free using the box provided at the bottom right of most pages on the site. Incidentally, most milestones you’ll see date from the 1700s or later, when new Turnpike roads were legally required to have milestone markers. It meant passengers and goods carried on the stagecoaches could be charged standardised rates for the distance they travelled. You’ll also see plenty of milestones along canals, also used to calculate how much people would be charged for moving their goods by barge. Further news about the missing milestone will be added as soon as it becomes available. Remember. Always dial 999 for ambulance services first! 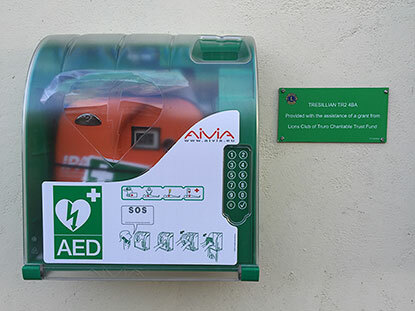 This is vital so that professional medical personnel can respond to an emergency and make their way as soon as possible to the patient’s location. ………. There are no further news bulletin items at present. Please visit again on a regular basis to check for updates ………. Click on ‘Stay Well This Winter’ logo for useful NHS winter healthcare information.